Livepkgr is a Flash based method of streaming that is provided to the user (you, yeah you!) via a folder and a .asc file with the SFTP directory of your Influxis account. This allows the user to stream to PC, Mac, iOS devices, BlackBerry, Windows and most Android devices. On this page simply copy your_rtmp.cloud.influxis.com. 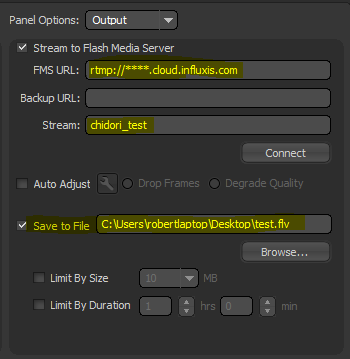 Now, in Flash Media Live Encoder’s FMS URL sections type ‘rtmp://’ then paste in your_rtmp.cloud.influxis.com with ‘/livepkgr’ appended that you have copied from your Account Settings.